Lots of low-power nodes are holding out nicely here at JeeLabs, by the way. There are about half a dozen permanent room nodes, and with the latest roomNode sketch they just keep going. Some are running on 3x AA rechargeable EneLoop batteries, others use 3x AAA with even less juice, and all of them have been running with just a single charge since the beginning of this year. I love you, everlasting jeenode. are you sure u did not accidentaly charged the battery a bit when hooking it up to the computer? Here i’ve got a roomnode (with PIR, LDR and SHT15, 3xAA) running since june 30th. Nothing fancy, but this one has been transmitting his status every second from the start. Still going strong. 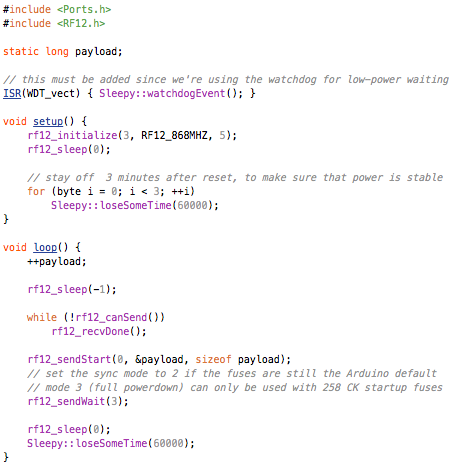 Hi JC, I’m surprised of your lifetime LiPo… I’m running the same code + SHT11 measures added in the payload buffer. Payload is sent every 5 minutes. My 3.7V (3400mAh !!) went empty after 3 months. I’m using a stepup converter (MAX1724)to keep supply voltage when LiPo is under 3.3V (2.8V is the limit because LiPo automaticaly shutdown at 2.8V because of undervoltage protection -> internal protection circuit). apart from CPU shutdown modes, you may have a high idle current from that step-up converter. How does that circuit work anyway, do you bypass the stepup until the battery voltage drops beneath 3.3 V? Is the stepup output set to 3.3V? (in which case it must be a buck-boost or SEPIC type converter, if it’s working while battery voltage > 3.3 V) ? Hi JC – a question I’ve been meaning to ask for ages and just got round to, which is that whenever you photograph Jeenodes you seem to show the antenna streched back along the circuit board rather than pointing out into the air – I’m guessing this is to get it in the photo and that you don’t run nodes this way? Nah, I usually run them that way as well – works fine for me. If range is an issue, it would indeed be better to point them outwards, perpendicular to the board as ground plane. And to orient all of them in the same way, i.e. vertically.